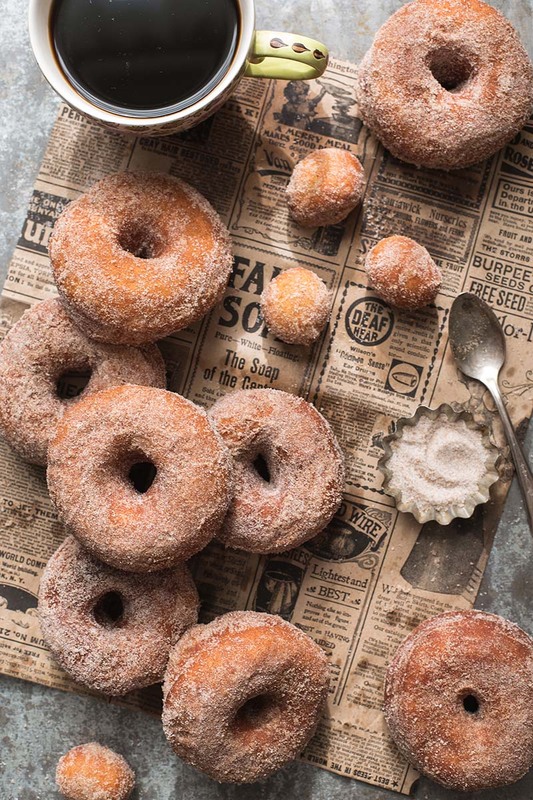 These Pumpkin Spice Sugared Doughnuts are soft on the inside, golden brown and crunchy on the outside, and have a sugary pumpkin spice coating. In the bowl of a stand mixer fitted with the paddle attachment, combine yeast and milk. Blend on low speed for 2-3 minutes, or until small bubbles appear on the surface. In a medium-sized bowl, combine flour, sugar, salt, and cinnamon. Add the flour mixture to the yeast mixture and mix until just combined. Add the egg and vanilla extract. Continue to blend until combined. Add the butter, one tablespoon at a time, until incorporated. Increase the speed to medium and continue to mix for 6-8 minutes, or until the dough begins to pull away from the side of the bowl. The dough should be smooth and slightly sticky. Turn the dough out onto a floured surface. Knead the dough until it is no longer sticky, forming it into a smooth ball. Place the dough in a large bowl that has been greased. Cover the bowl tightly with plastic wrap and place the bowl in a warm, draft-free area of your kitchen. Allow the dough to rise for 1 hour, or until it has tripled in size. To make the sugar mixture, combine sugar and pumpkin pie spice in a bowl and whisk to combine. Set aside. Turn the dough out onto a floured surface and lightly flour the top of the dough. Using a rolling pin, gently roll the dough until it is ½-inch thick. Cut the dough using a doughnut cutter. Gently drop the dough into the hot oil, frying 3-4 doughnuts at a time depending on the size of your pot. Fry on each side for 1-2 minutes, or until they're golden brown. Remove the doughnuts using a slotted spoon and place on a paper-towel lined plate to soak up the grease. Immediately dip the warm doughnuts in the sugar mixture, coating all sides. Transfer to a wire rack to cool slightly. The doughnuts are best served warm on the same day as they're fried. *If you're not going to fry the doughnuts immediately, place the covered bowl in the refrigerator until you're ready to fry. The dough can be made up to 2 days in advance. Let dough warm to room temperature before rolling out and cutting. This sounds delicious, but could I make them in the oven @ 350 degrees, instead of frying them? You can certainly try to bake these. Let us know how they turn out!